"What type of litter should I use for my kitty?" "Which are the best litters on the market?" "How much should I use?" Any complete cat litter discussion has to include all the different types of cat litter on the market (and there are many of them), as well has how much to use, how to please your kitty, and how to change products if that seems to be your best decision. Just as premium healthy cat food is better for your cat or kitten, so are certain types of cat litter better for the health of your feline friend. Additionally, you need to consider your cat's preference, his or her health, the effects on the environment, and the cost of the litter, and what is easily available to you. There a many types of cat litter to choose from. You may have preferences for certain litters based on environmental or economic factors, but your cat's preference should come first. You may need to experiment to find something your feline companion likes. One quick way to find out is to put out two or three cat litter boxes with different types of litter and see which your cat prefers. Of course, this may be a bit of a hassle for you, but it could prevent or put an end to litter box problems. If you try this test, ideally your litter pans should be the same type to eliminate this as a factor. Stay away from the dustier cat litters (those that create a little cloud after you pour them into the box). Your cat breathes in the unhealthy dust as she kicks the litter to cover her waste. Dust-free cat litter is definitely best for your cat's health. Many cats do not like deodorized litters. In their cat litter discussion, the ASPCA recommends an unscented, fine-grained, clumping style litter. If you stay on top of your cat box cleaning duties, you shouldn't need a deodorized litter to cut down on odor. If you feel you must deodorize your cat's litter pan, try sprinkling some baking soda or kitty litter treatment in with the litter to help absorb the odor. I don't recommend flushable cat litter. Most do not effectively flush (actually, I've never found one that does completely flush without sticking to the bottom of your toilet bowl); plus they are not very good for your plumbing or for the environment. There are a number of natural cat litters on the market that are cost effective and environmentally friendly, if this part of the cat litter discussion issue is important to you. If you're bringing your cat home from another home, try to use the same litter (and litter box) she is used to. If you want to, you can later change the type of litter your kitty uses. While changing the type of litter, you can use two boxes with the two different litters and when your cat seems to be reliably using the new litter, you can remove the old one. Depending on the types of litter, you can also try mixing the two types and gradually use more of the new litter until the transition is complete. If possible, when you find the right litter, try not to make a change. It's best to use what your kitty is used to. And of course, a cat litter discussion has to include how much litter to use. You'll need a layer of litter about two inches deep in the cat litter box. Only the soiled portion and feces need to be removed every day. After cleaning, add a little bit of litter as needed to keep the level at about two inches. Once a week, dispose of all the litter and wash the box thoroughly with unscented soap and hot water. Your feline companion will appreciate it and it cuts down on odor, too. 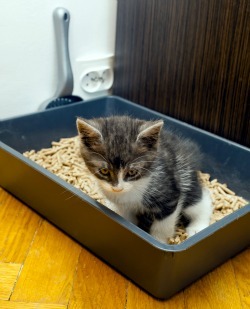 Kitten Litter Box Training - Here's how to training your new kitten to use her litter pan.